Natural wood benefits from sub-options that nature takes care of manufacturing. 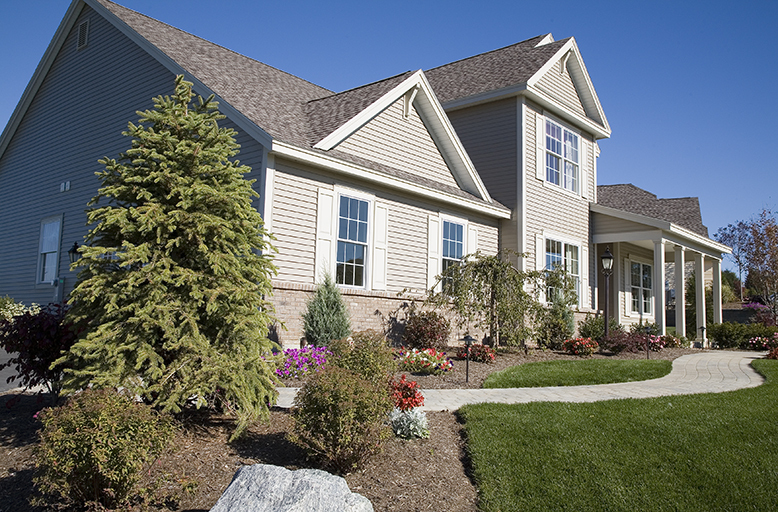 For residential siding, the types of trees (grains) routinely used are: pine, oak, spruce, cypress, cedar, redwood. With most wood siding projects, cuts are made to produce boards, or planks. How that surface appears indicates another sub-option dealing with grade. Boards where knots or other blemishes are visible are considered low grade, and less expensive. For building structure, this is fine, cause no one will see it. For siding that will be covered with paint, it is permissible. Beyond that, it is a matter of subjective choice. Many consider blemishes to be unsightly or a distraction, while others see it as mark of authentic wood. Man-made wood usually avoids such blemishes. Clear grades, or architect’s grade, are considered premium quality. Sometimes referenced as clapboard or lap siding. Traditionally, oak, pine and spruce are the natural wood grains that are used in this style, but really any wood grain can be used for lap siding. This is the most common style on homes in North America. It is usually what other materials (such as vinyl and fiber cement) mimic so as to blend in with other homes in the neighborhood or region. This style is easily identifiable as long, horizontal planks of wood on a home. Sounds simple enough, until you realize there are numerous sub-options for how the wood is cut and thus shaped to form each plank. Standard is each board is about 1 inch thick, and 10 feet or longer. Length is more of a construction consideration than style. Yet width of each board is a stylistic consideration, with 6 or 8 inches being the common choices. How the boards (or planks) are actually cut will determine installation. From the curb, bevel and clapboard look identical. Yet, they are technically different, based on how each board is cut. Clapboard maintains the same thickness, where bevel does not, going with thicker wood on what is the bottom edge (closest to the ground). Because boards will be stacked upon each other, how they fit on the wall together is another stylistic consideration. There are rabbeted edge bevel boards and non-rabbeted. While this has structural considerations, for how water will drain, away from joints between boards, it also has stylistic considerations. Furthermore, the bottom edge of planks may be curvy, rather than the usual straight-edge. While not even getting into paint colors or staining, you can see bevel has numerous sub-options. Really two styles here, but people commonly interchange them. This style is identifiable as each plank appears like short rectangular pieces, much smaller than horizontal or vertical boards. Traditionally, the two were differentiated by how they were cut. Shake being axe-cut, and shingles being saw cut. In modern times, they are likely all saw cut. Yet, the surface texture may be manipulated to give the appearance of shake. Routinely, people reference this style as “cedar shake” and thus the primary grain for this material is white or red cedar (light or dark appearance). Redwood or pine may also be grains used with these styles. Sub-options within this style deal with surface and thickness. There are thin smooth boards (shingles) which may have knots are no knots. And then there are thicker boards (shake) that have both sides cut roughly or one side smooth the other face rough. This is also known simply as vertical board wood siding, or sometimes referred as barn-style. Vertical panels (boards) are lined up side by side, and all seams are covered by a strip called the Batten. The pattern is usually done in a uniform way, to convey a sense of craftsmanship. Plywood, pine and fir wood are the inexpensive ways to achieve this style, but really all grains of wood are an option. Clear grades are sought here, though routinely this style is painted over. 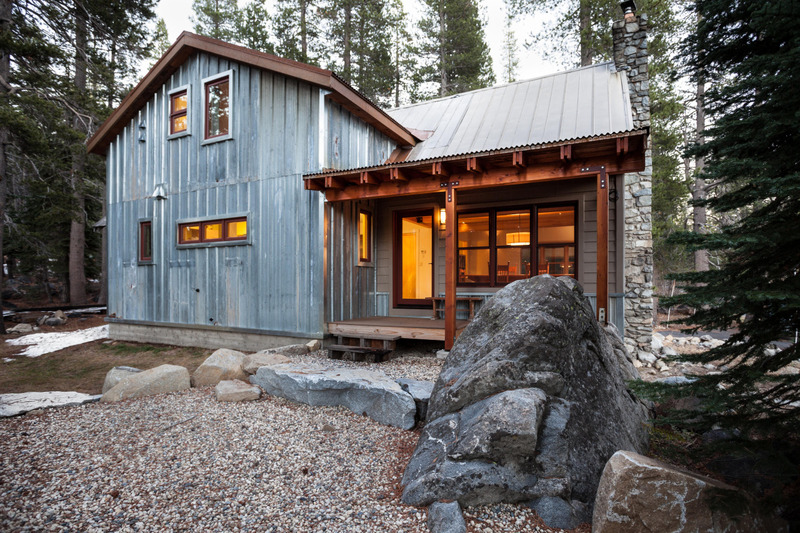 With a cabin, knotted grades are sometimes sought to deliver a more ‘natural’ appearance. Because of how this style is installed (rather simple), it is perhaps the easiest to maintain and to repair. Though a disadvantage, at least over the previous two, is that it doesn’t drain water away from the home as well. Also known as “D siding” because here the wood protrudes away from the home in the shape of, you guessed it, the letter “D.” Log cabins used to be common place in early North America. Today, they would be ridiculously expensive, and stylistically unwanted as the interior and exterior would look nearly the same. So, today we go with half logs, or smaller, to get the exterior appearance. Boards and shingles, while somewhat expensive, are not quite the price of split log, which runs between $2.25 and $5.00 per sq. ft. Why the wide range? Because not all split logs are the same size. Half log siding is 3 inches thick, between 6 and 12 inches wide (uniform width within an order) and 8 to 16 feet long. While this is clearly half of a log, some sellers may reference this as “full log” due to the other product, known as quarter log siding. Quarter log siding is 2 inches thick, and then all the other measurement ranges (for half log, above) are the same. This will be a thinner “D” appearance. Some sellers reference this as “half log” with the idea that the other version is “full log”. 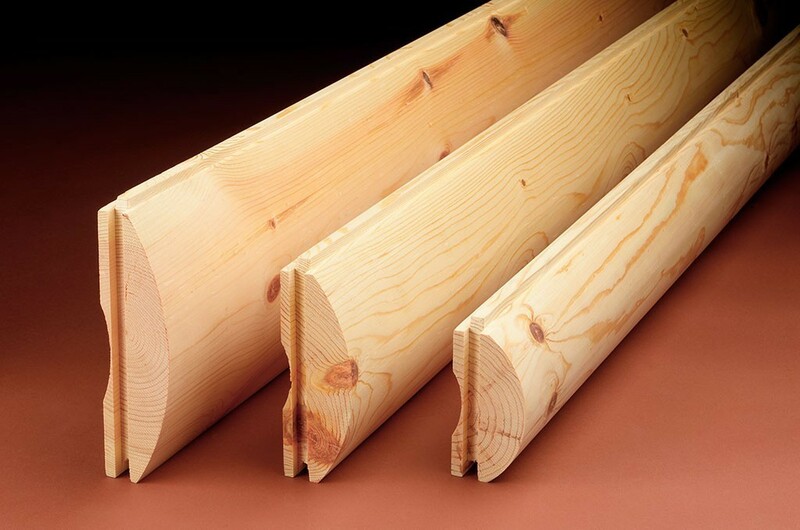 Pine and Cedar are the common grains for split-log siding. Unlike the other wood options, it is very rare that this wood is painted or coated. 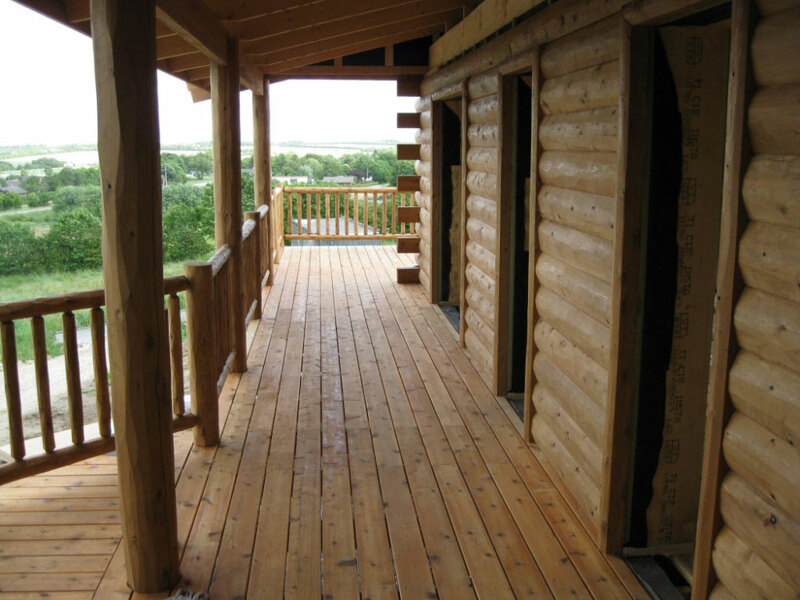 Though with pine, it is best to stain it, to ensure the wood lasts longer. With cedar, staining and painting is unnecessary, but must still be cleaned no less than once a decade. To chink or not to chink, that is the question? Because logs can have a fully stacked appearance, with no gaps between, or stacked with visible mortar between, the question of chinking comes up. Used to be, this is how log cabins were constructed. Think of cabins that have horizontal white stripes between the logs. Those channels are the chinks. In modern times, this is a stylistic option that allows the channel to be presented, but not necessarily filled. In today’s world, that filling is an acrylic compound. The benefits of chinking – it gives a more authentic split-log appearance, and adds layer of protection from wind or other things (i.e. animals) that may try to penetrate gaps. The disadvantages – it costs more, plus adds more to maintain, and some view it as a distraction from an all wood siding. But the channel, also known as the “reveal” doesn’t need to be filled. If left unfilled, it does appear as an all wood sided home. 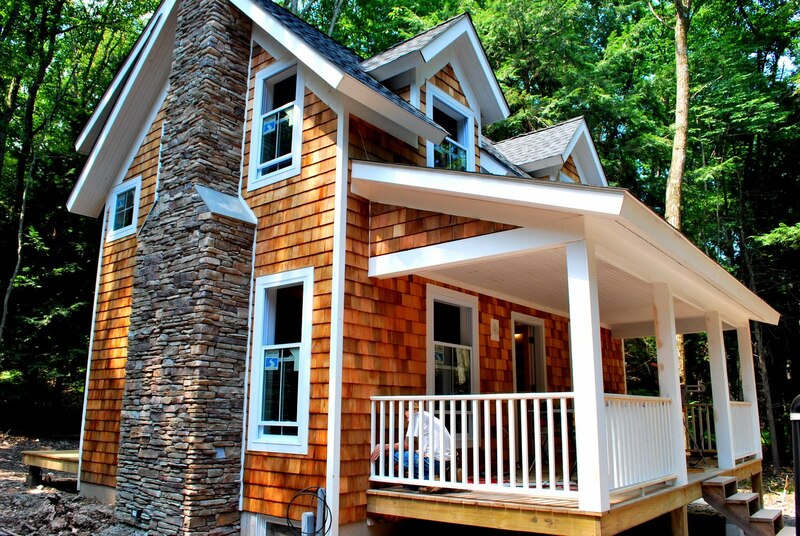 Wood is perhaps the only siding material that doesn’t require expertise to be installed. Yes, that helps. But a handyman or do-it-yourself person with carpentry experience can do quality installation of wood siding. A pro will likely be more efficient and have ability to obtain materials at a better price. Installation starts with covering exterior wall/sheathing with standard house wrap or felt paper, and depending on the style, nailing wood pieces in a systematic fashion to all sides of the home that are designed to match the primary style option. Easier said than done, but really is one of the easiest materials to work with. The R-value, or resistance to air flow, for wood hovers around 1.0, as one inch of wood is the standard measurement for exterior siding. Because of variation in grains, and styled options, the range is between .80 and 1.35. Shingle/shake and split-log have higher R-values, being that they are applications thicker than one inch. Spruce, Cedar and Redwoods, being softwoods, have higher R-values. 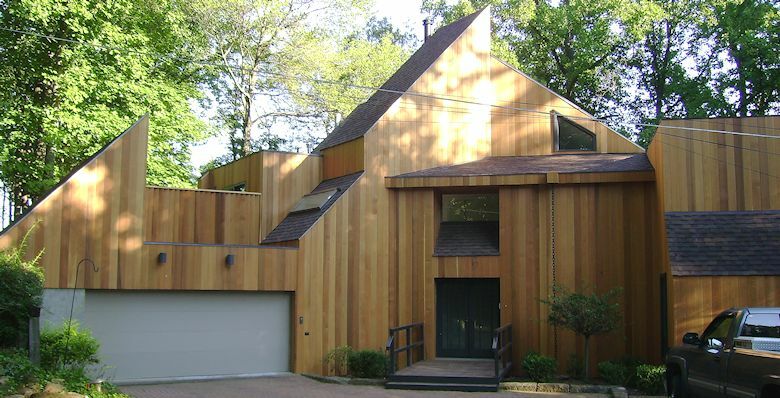 The caveat of wood siding is that it requires routine and ongoing maintenance. With a coat of primer, wood can be transformed into every conceivable color, so sub-options galore. 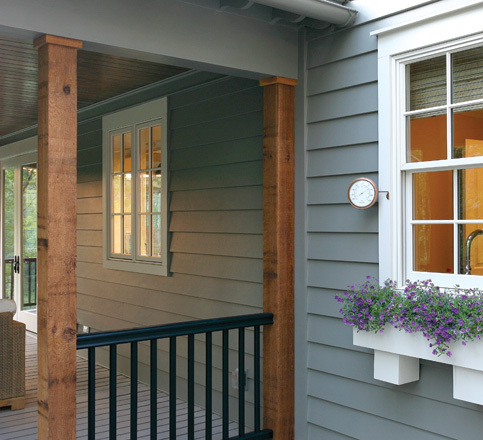 Painted finishes protect wood from weathering, fungus and insect infestation. Yet, they wear fast and when they do, this natural product can attract animals who feed off of it or make it their home. So painting is needed no more than every 3 years, but no less than every 10 years. Staining is an option that is rather unique to wood as a siding material. Unlike paint, staining is intended to bring out the natural beauty of wood, by accentuating the grain’s typical features. Additionally, stain is resistant to chipping and cracking, whereas painted wood reveals such flaws. And staining is less expensive since a primer layer is unnecessary. Clear sealers are another alternative which prevent moisture damage. Like stains, they make it so wood retains it’s natural beauty. Further you can spray fire-retardant chemicals onto wood for added layer of protection. All of this adds up to rather routine maintenance. If not done, wood siding will last 15 to 20 years. With regular maintenance every decade, wood can last 50+ years. Vinyl is the #1 material in the US. for residential siding, for several reasons. Being low cost, very versatile and low maintenance is hard to beat. Still, like all materials it has disadvantages, which we’ll get to, but let’s cover the basics. The technical name – polyvinyl chloride (PVC) is always shortened to “vinyl.” It’s really a heavy duty plastic base, blended with special additives to to resist color fading and protect it from UV rays. Versatility is often overlooked, but there’s not a style that it can’t emulate. Bevel, vertical planks, shake and shingle, and even split-log are all style options with vinyl. On average, vinyl siding costs $3.50 to $8.50 per sq. ft. installed, which even on the high-end is considered low compared to most other siding materials. For hollow-back vinyl, the price range can be as low as $2.50 to $4.50 per sq. ft. installed. For the averaged sized home, hollow-back vinyl siding translates to $6,000 to $12,000; and foam-back $12,000 to $20,000. Given the low maintenance and substantial warranty, this is very budget friendly. ROI for hollow back is nearly 81%, while foam back comes in at about 77%. With vinyl siding, the 2 primary options we focus on, deal with thickness or it’s insulation properties. Uninsulated vinyl siding is typically what is referenced, and is known as “hollow back”. Insulated vinyl uses a foam board backing to fill what is otherwise gaps behind the material for airflow. This greatly enhances the R-value (from 3 to 10 times more than hollow back). It also adds significantly to the cost, though surprising hollow back has the higher ROI. Horizontal boards, really lap siding, is the most popular style for vinyl siding. The closer together, or less wide, each board, the less the cost. Though panels and boards for vinyl are not the same. An 8 inch wide panel costs about the same as a “double 5 inch panel” which is really 10 inches wide, and has 2 ‘boards’ on each panel. Vinyl boards have a grained or slightly rough finish as well as smooth finishes. For the bevel variety, they are intended to closely resemble wood. The thickness of panels determines quality (durability) as well as price. The minimum thickness is .035 inches, while .052 is on the high end. Those numbers may appear odd, but the range is about 1/32nd of an inch to 1/16th of an inch. Most residential products fall in the range of .040 to .046. Panel length is usually 12 feet long. Actual length on a siding project is determined by builder’s preference or request of the homeowner as some prefer the look of no seams between the panels. Other lengths that are fairly standard are 16, 20 and 25 feet, with custom length paneling available at an extra cost. 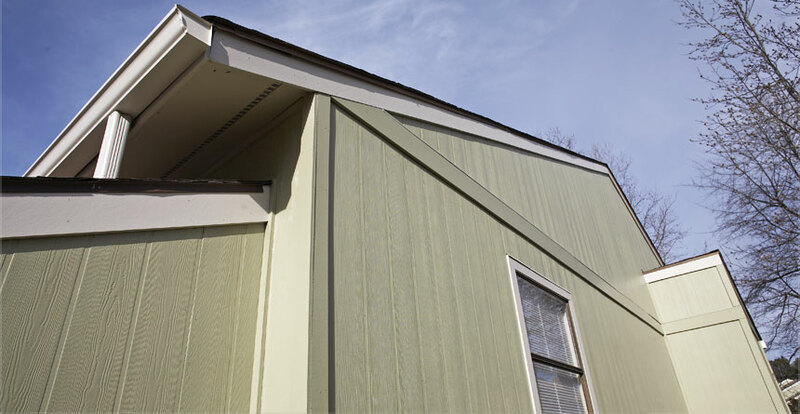 Like most siding projects, installation starts with a house wrap, that depending on builder’s preference may vary in thickness to help with insulation. After this comes the siding material, or the vinyl panels. Panels are installed from bottom of a wall up, nailing along a hem line and interlocking panels above it that snap into place. One qualitative difference is type of hem line, with single hem being weakest, and full roll over, or double hem, being strongest. Hollow back siding has an R-value of .6 to under 1.0. Going with foam back vinyl siding, the R-value increases to range of 2.0 to 5.0, which is significant and fairly high compared to all other siding materials. With colors and vinyl, it is important to note that the color is blended through the entire thickness of the material. Most other siding materials coats colors on the surface. Vinyl is doing it on and below the surface, such that when the color fades from the surface, the entire facade fades in a uniform, virtually non-discernible way. 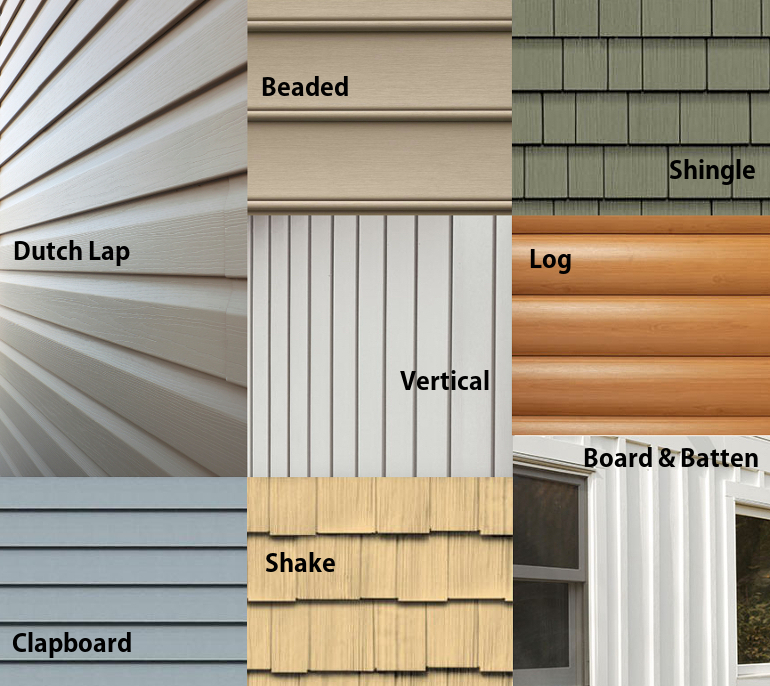 And while color options are nearly infinite, the reality is that vinyl siding installers carry a line of products that have say 15 to 40 options. Ordering custom specific colors is always an option, but carries additional cost. Maintenance is virtually a non-issue with vinyl siding. Rain will clean the material, but if it is dirty, yearly washing with a hose is likely to take care of the problems. No need for repainting. 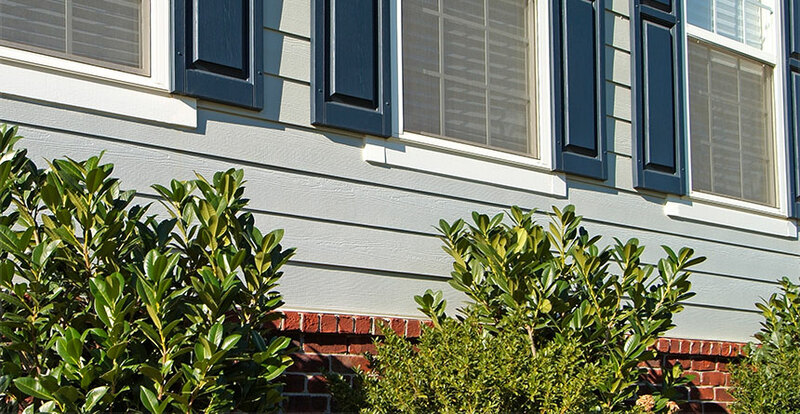 Typically, vinyl siding will last about 40 to 60 years before the color starts to greatly fade. Warranties for vinyl siding are usually ‘lifetime’ for the material, or 40 to 50 years. 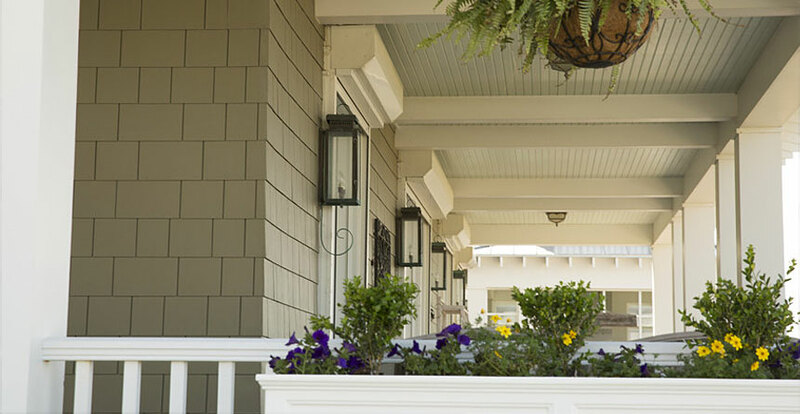 Commonly known as James Hardie, the original company to create this type of plank board. Their name is synonymous with the material. It is sometimes referenced generically as cement board. The actual material is a mix of wood pulp, cement, clay and sand. Fiber cement is about as durable as vinyl, minus the plastic look. The material will last between 50 to 100 years, though the surface may require repainting well before this. Per square foot, fiber cement is $7.00 to $10.00 for traditional lap siding installed. The other styles will likely exceed $10 per sq. ft.
For the averaged sized home, $15,000 to $25,000 is a realistic price range, but it can easily be more if trimming options are also using cement board. Installing fiber-cement siding is very labor intensive, the total installation cost reflects that. DIY or Not: If willing to risk the drawbacks and installation errors by going the DIY route, the same sized home could have a new fiber cement siding installed for under $10,000. Although, this is not a recommended option. The ROI is very good, coming in at 84%. This is based on the 2017 data, and our research showed that number was actually closer to 80% back in 2015. Fiber cement continues to be a premium option that is relatively affordable, compared to the other products that rely on masonry type work. Like vinyl, fiber cement’s most common style is meant to mimic bevel wood siding. HardiePlank has both smooth and textured/rough finishes. Going with the lap siding style, fiber cement has the highest ROI and scores 100% on the ‘Joy Factor’ from homeowners, according to NARI’s Remodeling Income Report. HardieShingle shows just a couple of options, but check out this page from Allura’s website showing a half dozen or so options in this style. In this style the board is 4 ft (wide) by 8, 9 and 10 feet tall, or long. There are smooth and wood grain finishes. Plus there is a stucco version to provide a different (than wood) textural option. Though as you’ll see below in our Stucco category, this is barely scratching the surface of the options in that style. 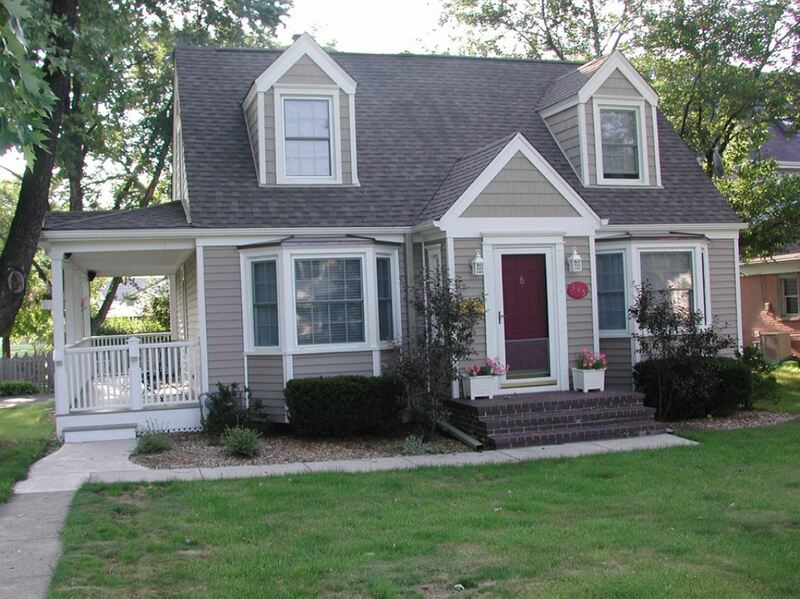 This style is James Hardie’s premium version of horizontal lap siding, or architectural grade. They provide a few variations boasting superior structural integrity and patented technology. 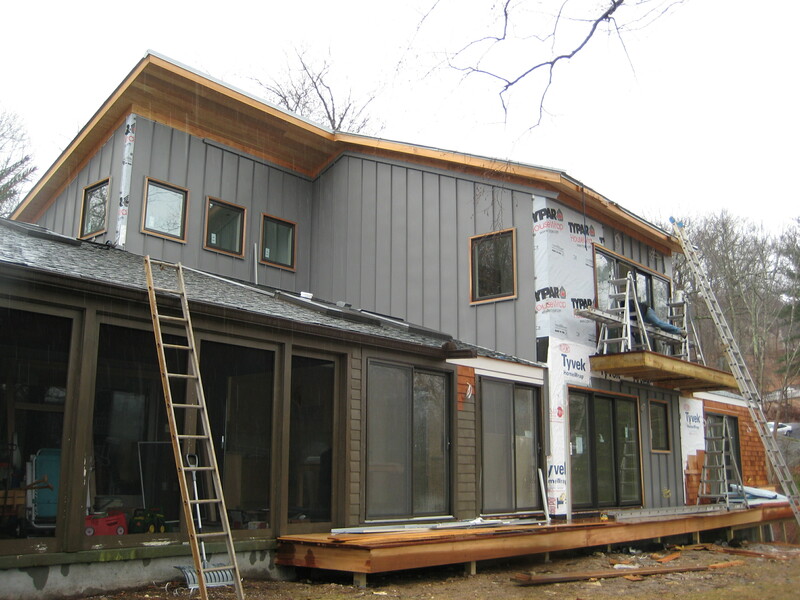 For installation information, we’ll stick to the traditional lap siding for fiber cement. This product is not geared toward solo DIY work. Cement board, as you can imagine, is heavy, and usually carried and adhered to a wall by 2 workers. The material is also expensive, so wasted material adds significantly to the project’s budget. Plus, the James Hardie manual for installation has over 80 guidelines, that change annually. In plain English, this is a job for experts. The R-Value for fiber cement is fairly low (at .50), and is considered below average in terms of insulation. Standard house wrap, before the siding is installed, doesn’t help with insulation, though a foam sheathing underlayment can, but only slightly. Colors like all other lap board siding are plentiful, though the material will outlast the coat of paint. If factory finished, paint warranty will go 25 years. Generally though, every 10 to 25 years, fiber cement needs repainting. While there is, practically speaking, one viable option for stucco, it has many sub-options. Being a texture oriented material, and the characteristic trait, there are really options galore. Made from sand, cement and lime, Stucco is really a plaster. The binding materials in exterior grade stucco are meant to hold up to weather. Stucco uses cement, where as gypsum plaster is the base for interior use. If picturing stucco in your head and thinking it has few or limited options, then you are really barely scratching the surface (pun intended). Given the amount of color and textured options, and how those occur, it has so many sub-options it rivals other materials on this list. The price range per sq. ft. installed is $8 to $12. This depends on location of the property as stucco is quite popular in some regions and rare in others. Materials, along with pros that do the work, are plentiful in some areas and sparse in others. In most regions $6 to $9 per sq. ft. is more of a fair range. It will cost between $16,000 to $24,000 to install standard stucco siding on an average sized home. 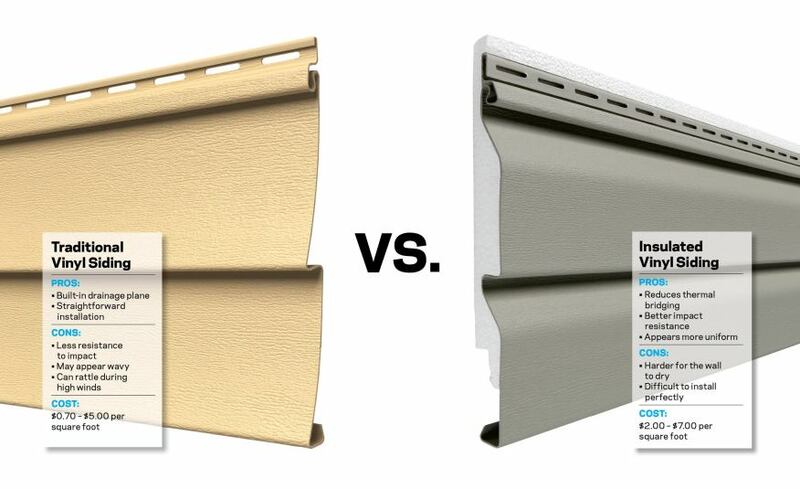 The ROI is a bit low compared to the other siding options, coming in at 70%. In some regions, it is much higher, as the quality and chosen texture pattern makes it more coveted. Because stucco is all about texture, the sub-options are somewhat basic. This allows for a whole lot of variation, via colors and additional materials (think minerals) in the stucco. Dashing can mean various things, but essentially is changing the form (or texture) of the stucco facade to a desired result. While that is broad, it covers color dashing, texture variations and then what is referenced as pebbledash (or roughcasting). With the later, instead of only cement/plaster as the facade, the material is mixed with pebbles, or shells, or other minerals to blend a design (and texture) that is more bold than a single color. To achieve color in stucco, it is always best to mix that in with the cement, and considered bad to apply the cement, then later paint it, as you might with wood on a house. Color mixed throughout means it will blend evenly and fade in a uniform manner. To achieve texture in stucco, the results are usually based on regional norms or expertise of the person/company doing the application. Sculptural stucco siding is an option, but not likely found on residential homes (as it is very expensive). So, simple textures are used from smooth finishes to the typical rough finish. Yet, there are many patterns that can be had with a ‘rough finish’ that range from tiny indentations (or protrusions) every few inches to granule indentations throughout the entirety of the facade. Like other masonry applications for home siding, there are multiple coats when used for applying stucco to an exterior wall. There’s the standard water barrier sheet that covers the wood sheathing, or base layer. Then comes a metal lath which gives the cement something to hold onto. Then comes the scratch coat, or cement layer that covers the lath and is what the final layers are adhering to. Finally comes the one, or more (usually up to 3) coats of stucco. This surface layer is similar to the scratch goat, but relies more on design technique to reach a desired result. The top coat will include some version of dashing and coloring. Because this is cement, the installation process depends on timing and thus experience to know the proper pacing for how it all needs to be applied. Not so challenging in a little 4 by 4 foot space. For an entire house, it is labor intensive. An experienced pro is highly recommended, but a DIY approach is possible. Just realize that mistakes may be costly and may lead to issues down the road that a novice may not realize during the application process. Application generally occurs via brushing the material on or from using masonry trowels. The former is great for repair type projects while the latter is best for ensuring uniformity and overall longevity. Single layer stucco is among the lowest for R-value. It insulates around .20 or possibly as much as .50 depending on how dashing is handled. If going with 3 coat finish, the R-value can go over 1.0, but higher than 1.5 is hard to achieve. 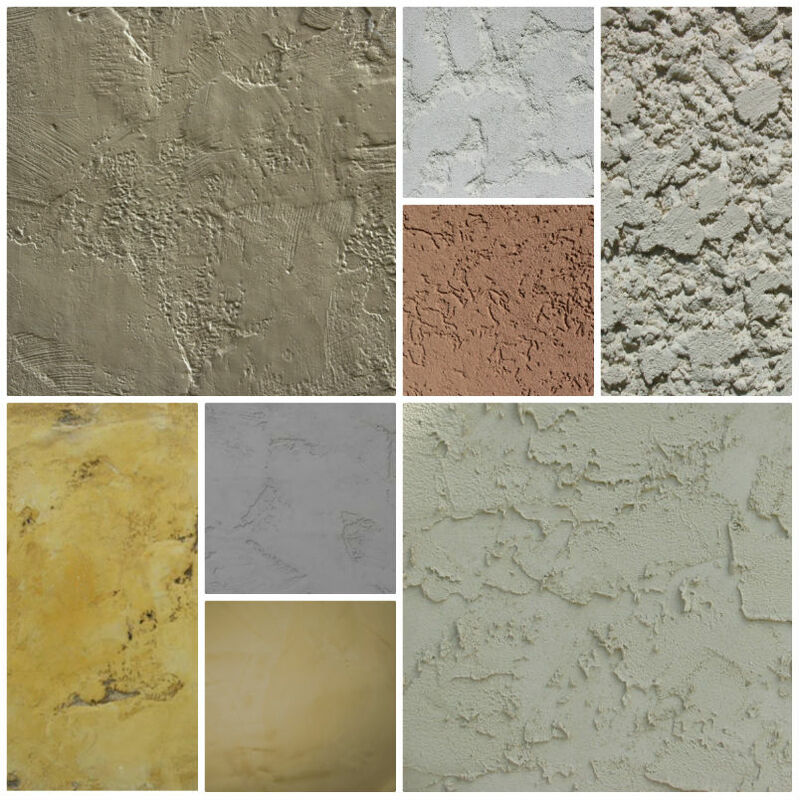 Synthetic stucco (also known as EIFS) is possible to consider as another primary option. We chose not to because the problems with this are notorious. The process uses more layers and in doing so, less of an opportunity for the water barrier layer to breath properly, leading to mildew and mold from moisture that is trapped below. The problem has certainly been addressed in the industry and improved upon, yet there is a stigma that is not easily shaken off. We suggest exploring this avenue with open mind, but realize that the primary option is the long standing, viable option. Brick, like Stucco, could be considered in the Stone category below, but has enough reason to stay on its own, not the least of which it is really fired clay that is the primary material. Comprised of clay, cement and gravel, Brick is durable and lasts a century or longer. 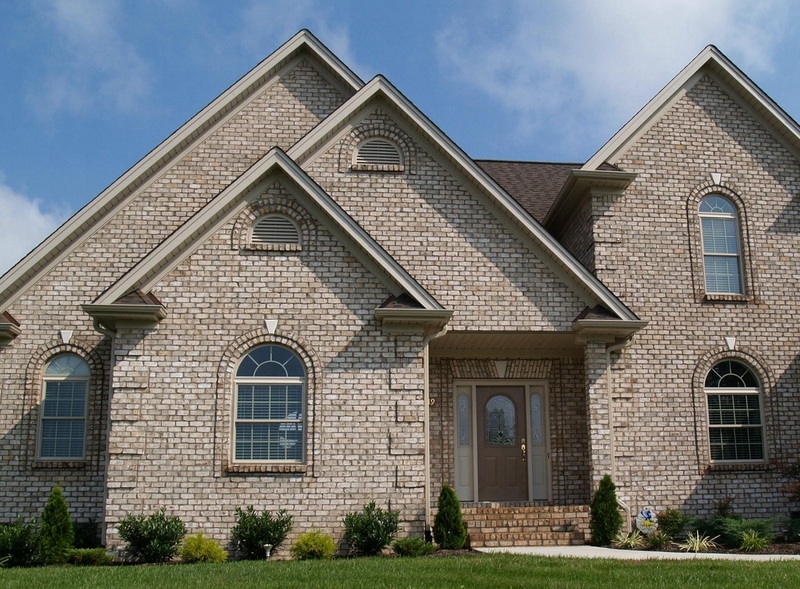 When it comes to Brick homes, there are 3 variations, only 2 of which are siding options after a home is constructed. A home built with brick, during construction, is actually what is holding up the home’s structure. With brick veneer, it is on the outside of the structure, either as thin brick (not recommended) or full brick, but single layer. Homes constructed with brick use 2 layers, called wythes. The cost per sq. ft. for brick siding falls in range of $10 to $17. This range depends on quality of materials (thick vs. thin), who’s doing the work, and region. A more fair range is $11 to $15 per sq. ft. The average sized home will cost $19,000 to $31,000 for thick brick veneer. ROI for brick siding starts at 83%. Depending on the region, going up to 92% ROI is realistic. The full brick veneer is the masonry way of brick siding, that is taking full advantage of what this material has to offer. Full brick is what people think of when they imagine a standard brick. It measures about 2 in high, by 4 inches thick and 8 inches long. As a veneer it is held together by mortar, but not attached to the sheathing of the exterior home wall. For good reason. Brick absorbs water, gradually. As moisture seeps through the brick, it drains downward by gravity. This is also a slow process. If full brick were attached to the wall, even with water barrier, it can pose problems of water drainage, and lead to mold and mildew. Because of how solid the construction is, correcting such problems is very challenging. So, instead an inch gap, no more, no less, is left between wall and brick. This actually increases insulation and is effective for water drainage. Thin brick is the alternative that uses brick faces under an inch thick. This is adhered to the home’s wall via grout. Because there is far less brick dimension, water drainage is far less of an issue, and the vapor barrier is seen as suitable protection. Like stucco, a metal lath is used to adhere scratch coat of grout to the sheathing / vapor barrier, and then surface grout holds the brick to the wall. There are a few sub-options here where paneling systems are used vs. the quasi-masonry approach. Metal panels with holders mean scratch grout is not needed and installing bricks to the wall is easier. A surface layer of grout is added to cover the metal panel and to give the distinct brick look. We note this as ‘not recommended’ because it greatly reduces the insulation aspect that comes with brick siding. It’s also not as durable as full brick. It will work fine and look nearly identical to full brick, but has disadvantages which don’t lead to the longevity of full brick veneer. Full brick as a veneer is labor intensive and definitely takes skill to install. It is not a DIY type job, and relies on person with masonry expertise. While the paneling systems that use thin brick veneer can be had via DIY approach, it’s arguably more prudent to have masons do even thin brick veneers. Colors for bricks are rather sparse, relying on earthy type tones. Generally, they are dark red (clay like) or lighter cream colored. Unless specified, the color is usually not uniform throughout the brick, nor from brick to brick, which for most projects is not desired. It is more authentic to have bricks of slightly various colors on a facade. If brick is painted, it then becomes part of ongoing maintenance as the paint will likely fade, chip or crack long before the material needs replacing. Full brick has a standard R-Value of .44. With proper installation by a mason, that number is actually slightly higher due to the air gap between wall and stacked brick. With installation of thin brick, the material itself is around .11, R-Value. 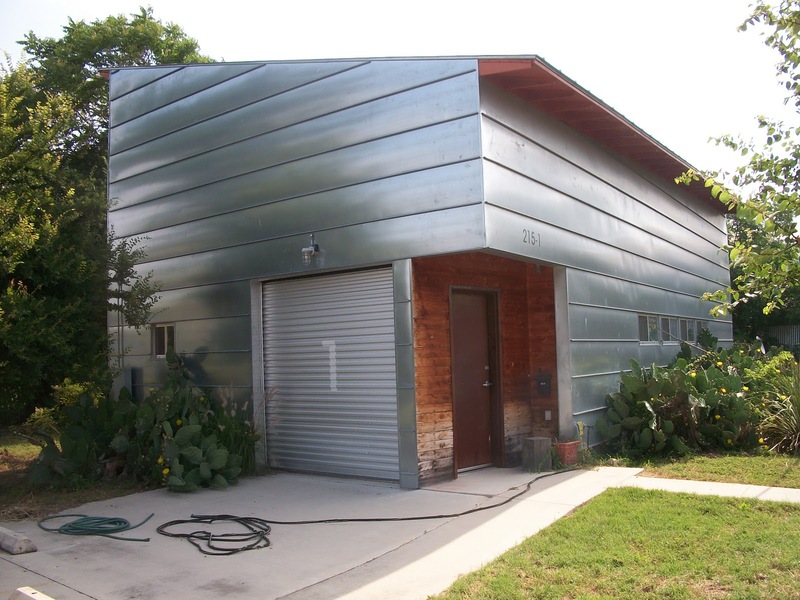 Design-wise, metal siding is malleable and thus very versatile. It can be shaped into any style listed so far. It tends to have its own style, such as corrugated sheets. For the purposes of this guide, the 4 options we will consider are the most common metals used as cladding for residential structures. Essentially, these are 4 minerals that are manufactured metals, each with their own advantages and disadvantages. Metal has a very wide range of $5 to $35 per sq. ft. installed. This somewhat depends on region, how the material is coated, and whether there is foam backing. For aluminum and steel, under $10 per sq.ft. installed is possible. More than $10 is for architectural grade metals or specially treated aluminum and steel. Copper being the most expensive per sq. ft.
With such a range we hesitate to provide an ‘averaged sized home’ cost. The ROI for metal shows a national average of 86%. This can easily be higher depending on the region. Thus, Metal is one of the better returns on investment for what you will spend and what you can expect to get in return at time your home is sold, especially as this material will last a long time. As an alloy of iron, this metal is plentiful and highly durable. It is more dense than aluminum, thus the same gauge (thickness) of steel compared to aluminum, will be more durable. Though more dense also means less malleable. By galvanizing steel, it makes it ideal for painting, and in general galvanized steel holds color better than aluminum. But the fact is, steel needs to be galvanized or coated (with paint), as steel when it weathers will rust. The flip side is that steel doesn’t corrode in the way aluminum can, so if it stays protected, there is less maintenance involved. If a home is in a climate that has lots of moisture/rain, steel is an okay option, but not ideal whereas aluminum might be. The reason we compare aluminum to steel is they are the primary 2 options, being the two most plentiful metals around. If looking to obtain metal panels or sheets for siding materials from your local DIY type store, or even many places that wholesale metal siding, chances are they only carry steel or aluminum siding. Another significant difference between the two is that steel is considerably more expensive than aluminum, though for aluminum to reach the same durability as steel, does add to its cost. Much of what is said about Steel (above) can be said, in contrast, to Aluminum. Such that Aluminum is softer / more malleable. With regard to siding, Steel corrugated panels are the traditional material for residential purposes, but not so much for home siding. The product works well for sheds, and possibly for roofing, and even for interior application. Yet, in today’s market there are variations, with aluminum as the base metal. Then, there are numerous ways in which the corrugation pattern appears, such as wavy, ribbed, or beamed. With any of the non-metallic forms of siding, i.e. shingles or board-and-batten, realize that whatever the metal is, it can be shaped into this form. Depending on the metal, it costs more and has its own advantages or disadvantages. With aluminum, it tends to be the least expensive metal material. And because it is lighter, it is usually easier/less expensive to install. Aluminum doesn’t hold color as well as steel. This doesn’t mean aluminum can’t do coated finishes, but instead means that if say a few years go by and a panel or piece of siding needs replacing for any reason, it might be very challenging to find a color that matches with the the rest of the facade, whereas with steel the color will hold longer over time. The great news is that aluminum doesn’t rust, so coated finishes aren’t really necessary. Though they are likely desired. And aluminum does corrode, or can become chalky over time. Repainting or re-coating the aluminum facade becomes a part of ongoing maintenance to overcome corrosion. Fortunately, there are other metal options that will neither rust nor corrode, at least in a way that requires maintenance. 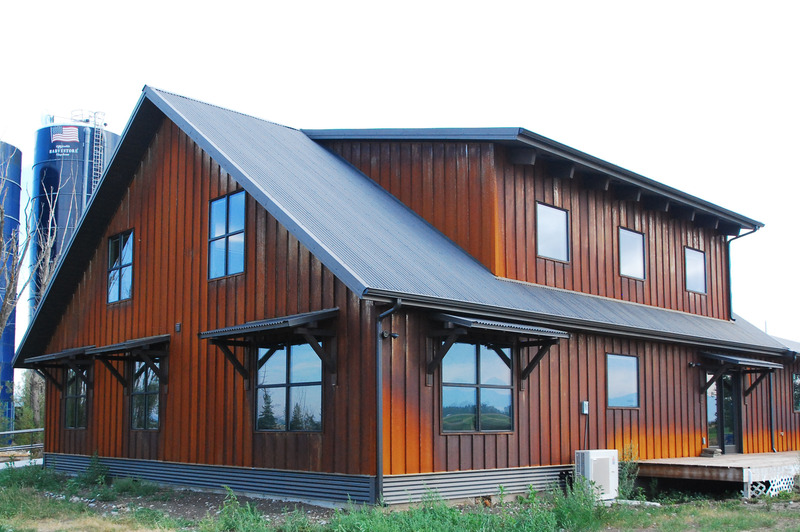 Copper is gold-like in appearance, which is a magnificent, if not bold, siding option. It is corrosive resistant. 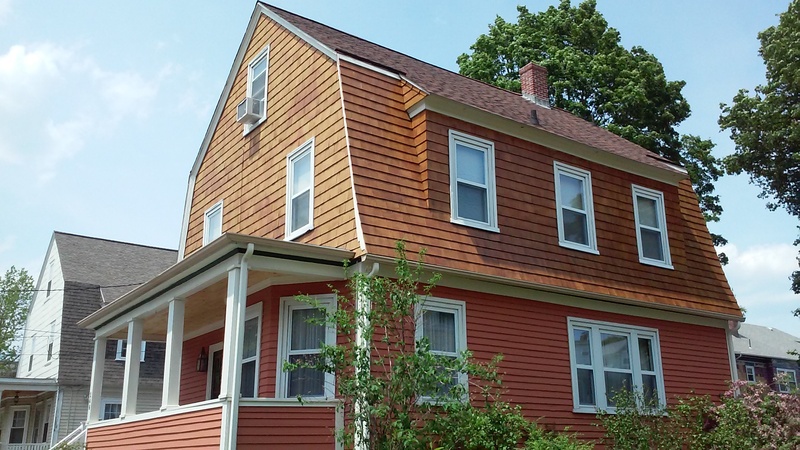 To say it doesn’t rust, is technically not accurate, but the way in which it changes over time is part of its allure as a siding. Being gold in color, this is usually sought as a great place to start. As the metal (even if coated) weathers, the material oxidizes and changes to a patina green. This then forms a natural protective layer that coats the surface, for a very long time. Copper is very durable. The material will last hundreds of years and the natural color change, that takes place in first 30 years, will last as long as the metal does. 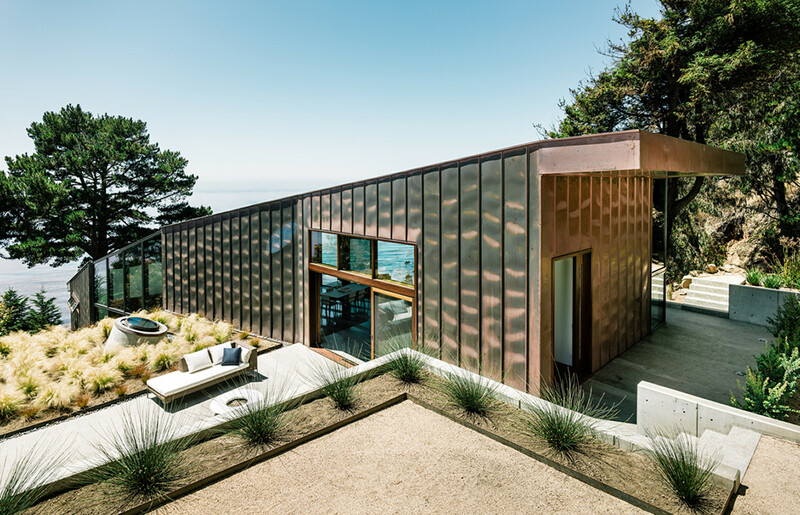 Copper has been increasingly popular in modern architecture, which means it is becoming slightly more viable as a cladding option for residential use. Steel and aluminum still dominate the market, but given the advantages (i.e. nearly non existent maintenance) of copper, it is a metal option to consider despite the upfront costs (about $35 per sq. ft). Especially if the color options with copper appeal to you. 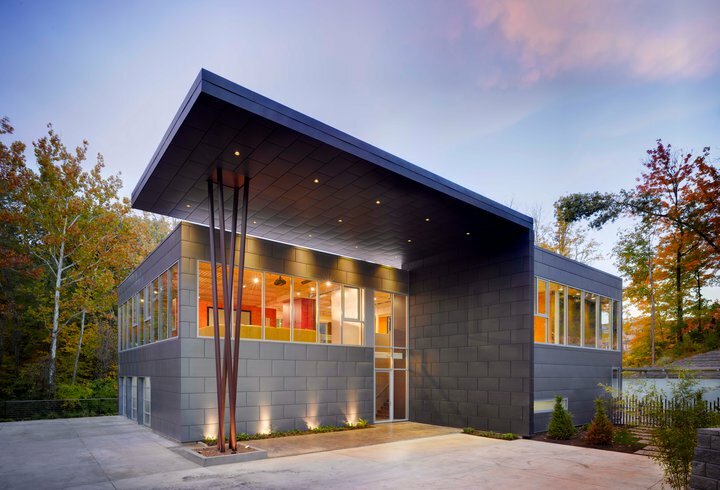 Zinc cladding, like Copper, resists corrosion. Also like Copper, Zinc starts off one color (usually a dark color, similar to Cobalt) and changes over time, in this case a patina blue. It also doesn’t need painting during its life cycle, as the patina acts as protective coating for the life of the material. Rainwater tends to run off from zinc better than other metals, which means it has more resistance to mold and fungus. Because of how popular aluminum and steel are in the market, all data after this section is conveying information about those two materials. But to be clear, metal in general is malleable, so all materials mentioned above can be shaped in whatever way a project calls for. 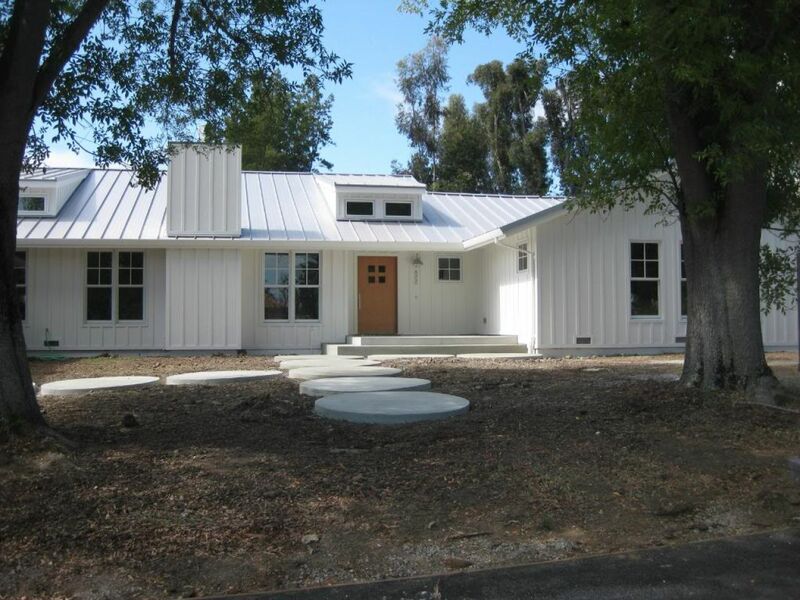 Panels are most popular, but shingles, planks, or even split-log are all possible with metal. If the metal is factory-finished with coated paint and sealers, this usually carries with it a warranty, of 20 to 30 years. This means it is unlikely you’d need to repaint it before the warranty, or if you did, the warranty would cover it. Metal is recyclable. Other siding options can’t readily say this, and are usually hauled away as trash for a landfill, while metal is hauled away knowing that it is scrap which will likely be recycled. All metals can dent and scratch, but some are easier to tarnish the surface than others. Aluminum is the easiest to tarnish. Steel is an example of material that once its coated surface is removed, via a scratch, it needs immediate repair, or will rust. Installation depends on the form the metal is shaped in. As many of the retail home improvement stores do carry metal paneling, it is possible to go the DIY route, though this is usually for shed siding or roofing. For residential siding (or roofing), it is strongly suggested to go with a professional contractor, because of how malleable the product is along with how dangerous sharp edges or corners can be. When it comes to color, like Wood, there really is no limit in the sub-options. Yet, painting wood is much easier for the DIY’er than painting metal. With factory-finish paints, the wholesalers make a fairly wide range of colors available, and custom coloring is always an option, but does cost a bit more. Chances are the available color range will work for most home owners. The R-Value for non-insulated steel/aluminum is .61, which is less than Wood, but more than Brick. It is possible to add foam siding, akin to what vinyl offers, which obviously adds to the cost. Insulated backed metal siding can increase the R-Value to neighborhood of 1.82, which is among the best on our list for all materials. Stone is our last material category. Like wood it has natural beauty that is cherished by many. Also like wood, it has a man-made version that seeks to be as durable and less costly. Hence the 2 options: natural stone and Faux stone, aka Cast or manufactured stone veneer (MSV). And like Brick, the 2 primary options are really veneers or facades covering the structure of the house, not the structure itself. As in, if the stone were removed it wouldn’t lead to structural collapse of the home. Natural stone costs $17 to $29 per sq. ft. installed. Faux stone comes in at $11 to $18 per sq. ft. installed. For pretty much all other material categories, the average sized home can be done for under $20,000, even if done by a contractor. With Stone, that is likely only possible if a) you do combination of stone and another material or b) going the DIY route, which means a lot of (hard) work for the person going that route. 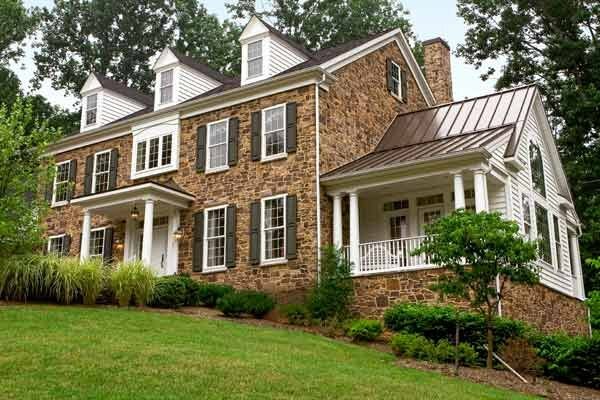 Yet, given the benefits that last a very long time, spending $65,000 (on the upper end) for stone siding certainly sounds expensive, but means less cost over the first 100 years of the home than arguably all other materials, with metal being the only exception. And ROI for stone and stone veneer is top notch, coming in at 92%. Considering the longevity of stone, and assuming it is minimally maintained, the ROI is simply unmatched by all other materials, with Brick and Metal being the runner ups. But before we over promise on the ROI for stone, check out this article that emphasizes how important proper installation truly is. Nature has been awesome about manufacturing stones for thousands (or more like billions) of years, to be used in construction of buildings and homes. For stone veneer, larger rocks and boulders are cut into thinner slices. It wasn’t always this way. Not too long ago, construction jobs used to have large rock or boulders delivered on site to be used and cut into shapes that the crew needed at the time. Now, it’s a much more systematic process and cutting boulders into smaller pieces makes it easier to transport and quicker to install. The most common stones used are granite and limestone, but this is where sub-options begin to take shape for this siding. Popular patterns or layouts for stone veneer include: stacking (very common), cubing, mosaic and earthy or classic (where the mortar is seen between each stone). With stone veneer, the wall’s overall texture is a defining characteristic. It can be flat, as is case with mosaic and cubed patterns. It can be slightly protruding, such as with earthy designs. Or it may be significantly protruding, such as with stacked options, especially those using round stones. Plus there is the texture of the stone itself and/or the way cuts are made in the stone. There is a lot of variation for stone that is often overlooked when first considering the material, but take a look at the bottom (two thirds) of this article from This Old House site for a sampling of patterns and texture. The industry refers to this as Cast, but it’s easier to present it as faux for our purposes, or the way some sellers present it. MSV is the alternative, shorthand way of referencing this type of stone veneer. Made from concrete and using a dozen or so pigments, Faux stone is able to match the natural look. It used to be fake was readily discernible from natural, but not anymore. The Faux is cast from molds of natural stone, so it has same authentic shape. It benefits from being a lot lighter. This makes for less cost to manufacture and to then install, as it is less labor intensive. 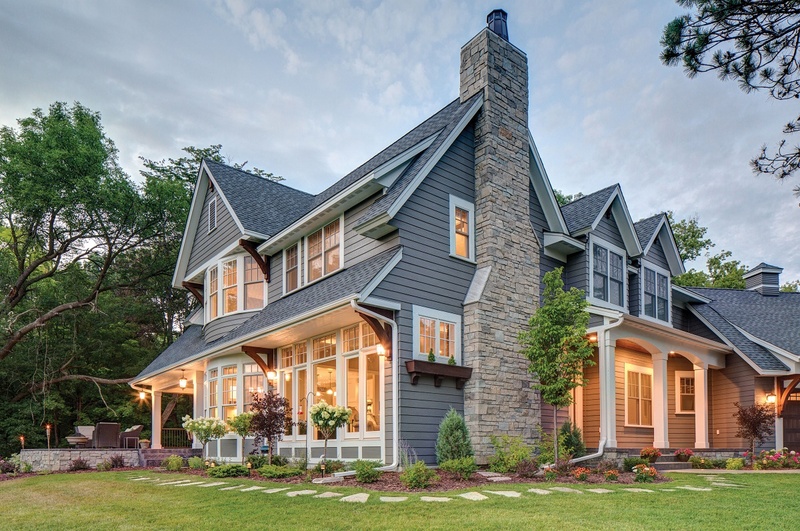 The previous link from This Old House site conveys the look better than words can, and provides many of the sub-options available by going this route. While being lighter has its benefit, it is also plausibly a drawback, as less dense means it won’t hold up as long. Yet with stone/cement, we are talking a minimum of 60 years and with (natural) stone veneer 100+ years is the norm. 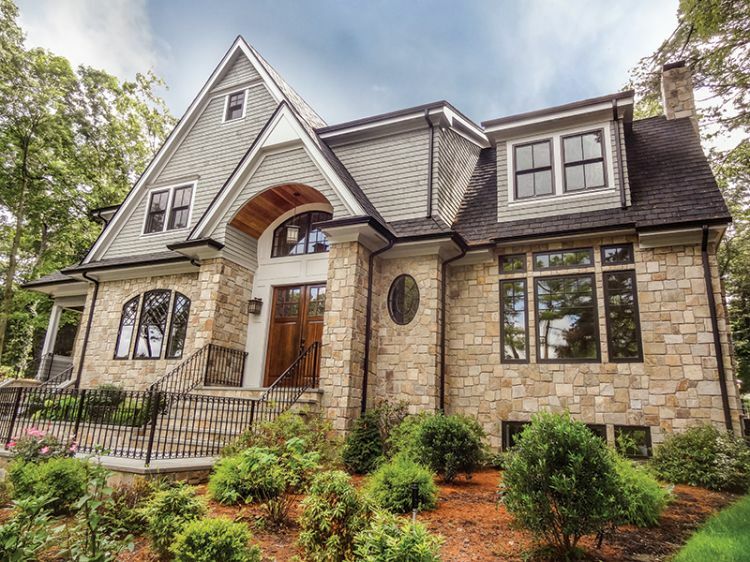 Like Brick, there are paneling systems that make it possible to purchase pre-stacked stone siding that isn’t all that challenging to put up as a facade. But some of that is tailored to interior purposes and is not recommended as ideal choice for exterior siding. For that, a mason or stone siding expert is your best bet. Stacking stone and binding it together into a consistent pattern is very labor intensive. It’s either fairly costly, or takes the non-pro a long time to install siding for even a small home. At least to do it right. Like stucco and brick, MSV poses problems that may not be known immediately after installation. The basic process is underlayment material, covered by metal lath, coated with scratch coat of grout, and then a coat on top of that which the stone is set. Yet, moisture control that will inevitably occur below the stone must be taken into consideration, or there could be problems down the road. A pro understands this, and is not apt to leave a job where rotting of home’s sheathing is likely to occur due to improper installation. Of all the types of siding, stone veneer is among the most expensive to install. Here is a link for the DIY approach, though in our opinion this makes it seem a little too simple. The R-value for MSV is listed at .41. That’s similar to full brick veneer. Natural stone is, ahem, naturally higher but not possible to account for given the wide variation in shapes and styles that exist. Suffice it to say, the R-value for natural stone veneer could be as high as 5.0 which makes it among the top in terms of insulation qualities, but also likely the most expensive siding option if going this route. Color is generally limited to what is natural to rock. Mother Nature has options that are nearly white or light in color to very dark. With Faux Stone, there’s theoretically no limit to the color, but manufacturers are intentionally looking to match the natural variety and not likely to produce say purple or pink stones. For many stone veneer facades, color is generally not sought to be uniform and variation in color on cladding is thought to be more authentic, if not more beautiful. Unlike brick, stone is usually never painted. So, with stone, there is really no reason to update the color down the road. For natural stone, that will last over a century, this is significant consideration especially when realizing how this impacts the initial investment. With cast stone, color updating is not necessary, but there may be reason to use repair kits which correct chipped pieces and match the color in that particular piece. In our final section “Unleashing Your Imagination” (below) we mention combinations and siding. Stone veneer is arguably the most likely to be used in combination with other materials. 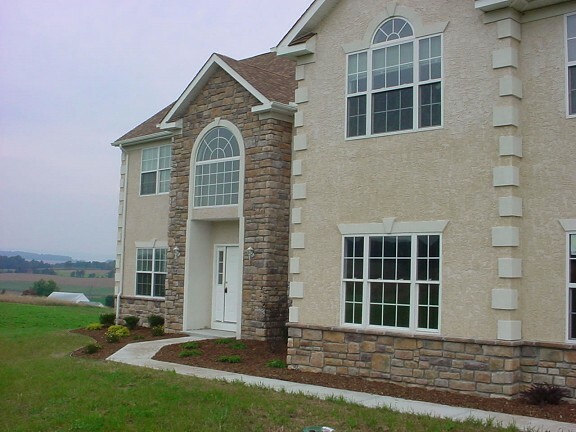 Homes with all stone veneer exist, and thus realize the full benefit that comes with the advantages noted above. Yet, often you’ll see stone cladding installed near the front of a home to accent a particular feature. Even used sparingly, stone manifests a majestic appearance. As if the umpteen hundred sub-options we noted or alluded to in this article aren’t enough, there’s a final point to be made regarding combination of materials. Stone with most other materials, but particularly wood works well together. Wood and vinyl or fiber cement tend to work together with one on top (usually wood) and the other (more durable) on the bottom portion. Going through all the possible combinations is not possible. We suggest taking a drive in your own neighborhood and looking at existing combinations that are visibly working in your region.